There is nothing quite like the beautiful, quality look of a marble kitchen or marble bathroom. This luxury stone is still in high demand even years after it first came into fashion, and, thanks to our experts here at Pure Quartz, more and more families across Bromley, Lambeth and South East London are in a position to enjoy a huge range of marble floors, kitchen worktops and bathroom worktops. The different varieties of marble stone now available is quite staggering – from office worktops to kitchen tops and marble floors. We’re here to introduce you to this wonderfully luxury stone for less. Our professional and trusted team of experts, design specialists and fitting and installation engineers are here to look at the best ways in which we can introduce the marvellous, natural veneer of great-looking marble into a variety of rooms in your home. From offices to kitchens, bathrooms to wet rooms and more besides, marble remains a house refurbishment staple which is becoming more and more affordable – and our low cost. Buy now and pay later service will appeal to any household aiming to step into a new era of contemporary – yet classical – luxury. Here at Pure Quartz, we are just as proud of who we work with as much as we are with the value and quality of service we provide to each and every one of our customers. Santmargerita, Samsung, Compac, Istone and Arenastone are just some of the big brands and supplies we work with to ensure that our home designs and installations really land with that luxury touch. While we do specialise in a wide range of luxury Silestone worktops, stone countertops and more besides (in marble and beyond). We do also specialise in replacement kitchen worktops and budget kitchen worktops. Allow us to show you how spectacular your kitchen, bathroom, office or flooring throughout could transform into a spectacular, natural and beautiful new look. From stone worktops to high quality marble finishing, Pure Quartz offers more than just quartz – we are experts forged in stone, quite literally. Looking for Affordable marble installation ‘near me’? We offer flexible, affordable kitchen, bathroom and office marble worktop and countertop installations to fit a wide range of budgets. Speak to any member of our friendly and professional team. We will happily set you up with a free, reliable quote and timescales under which we can really bring your fantastic new marble look suite to life. 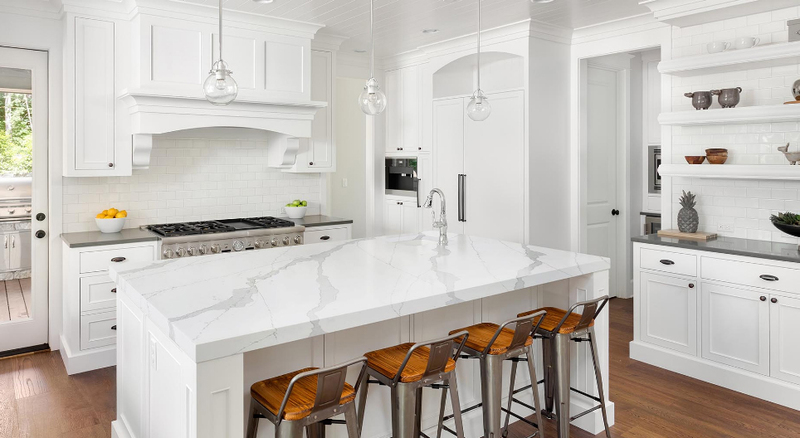 You’re going to need to lead with a long-standing firm who are experts in quality stone and marble design – Pure Quartz have the answers, the supplies, the tools and the expertise. Call us today for more information on 01233 733111 or email us with information on your upcoming refit or refurbishment. Let us know how we can be of assistance – and do take a closer look at some of the fabulous ways in which we’ve put marvellous marble to work through previous projects. Why not introduce marble into your home for less? Let us help you make that a reality.